The days of dinosaurs have always been a source of fascination to the modern world. Connecting to the past can morph into many types of collecting, and model collecting would have to be considered one of the most popular forms. To be able to look at, hold, and study the features of an animal long extinct can be a thrilling and satisfying experience for young and old alike. When collecting prehistoric animals, no collection would be complete without the woolly mammoth. People always seem to have a special connection to the woolly mammoth that they have with no other animals from the distant past. Early man would not only hunt the mammoth to survive, but paint their images on cave walls out of awe and respect for such a majestic animal. To this day, the woolly mammoth still draws the same awe and respect that early humans held for it in their humble beginnings. Fortunately, the makers of woolly mammoth toys understand that the more realistic the model, the more immersed you can become in thoughts of a distant past. Their toys are not only great for children; they are also perfect for the collector who wants only the very best. The models are sculpted and hand-painted, paying attention to every fine detail. Made of a hard vinyl material, you can be certain that they will be a proud part of your collection for many years to come. Part of what makes us feel a closer connection to the woolly mammoth than most of the prehistoric creatures is that completely preserved specimens have been discovered in places such as Siberia and Alaska. We have been able to study them in a way we could never do with most other animals of that time. This makes it possible to know exactly what the woolly mammoth looked like in its lifetime. The makers of woolly mammoth toys take full advantage of the knowledge gained from the discovery of such specimens. They use that knowledge to bring you some of the most realistic looking mammoths in the collecting world. When you see the work and quality in each toy, you will feel as if you are holding the past in your hands. When holding one, it is not hard to understand why the woolly mammoth has held such a fascination for us since our ancestors first walked beside them so many years ago. Whether it is for a child who wants a toy for hours of dinosaur fun or for a serious collector, you cannot go wrong with woolly mammoth toys. When you hold one in your hand, collector or not, they will bring the child inside you to life as few other toys could ever hope to do. If you want a sculpted, hand-painted toy that is made from high quality materials, then look no further. This will be a purchase you will never regret. It will bring a smile to any child's face and you will also find a smile on your face as well. 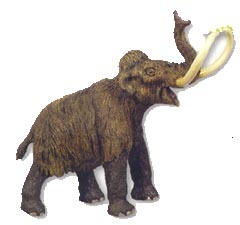 If you'd like to know more about the magnificent woolly mammoth toys or any dinosaur or Ice Age items, from decor items like dinosaur-themed linens or reproductions of Joseph Moravec's amazing oil paintings of dinosaurs to dinosaur toys and party supplies, click here, and come visit The Dinosaur Corporation.com.